Wow! 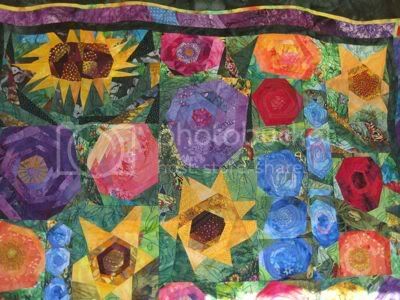 I love the mix of roses and sunflowers in that quilt. Thanks for posting it. Very inspirational. As if I didn't want to win badly this month already. Thanks. That would be fun to create! My mother-in-law was at a quilt retreat in Sisters last month too…I wonder if we're talking about the same place…in Oregon? Sophie, isn't it pretty? It makes me want to try the sunflower block too. Ruhammie, Yup you got it! Sister's Outdoor Quilt Show. A group of us rented a house down in Sunriver, there were classes on Friday, the show was on Saturday and there was a lot of (fabric) shopping, coffee and chocolate in between. Heh. I highly recommend going if you get the chance!